UPDATE: I changed a lot on this patch, after listening to it I think it sucked majorly. Lack of higher frequencies and not enough “middle crunch”. Here it is to you again with a few changes. The equalization curve is VERY important, even for YOUR setup! Please listen to the clip. Yes I know, all of us are striving to achieve AC/DC tone or for that matter, classic rock tone. Since this is an extremely long subject that I intend to treat as in depth as humanly possible (many, many considerations are needed here) I will just narrow the matter here and just talk about my current settings on the Eleven Rack (a piece of hardware built into a rack shape by Digidesign – Avid Digital – that “models” guitar recording) to achieve decent AC/DC (Angus’, but it could apply to Malcolm’s as well) tone. What is extremely important as a premise for us to understand – me included, I just learned this recently – is what is called a signal path. Id est (i.e.) what path the guitar signal makes before it gets to to tape or to disk (nowadays) when being recorded. Having said this, I will concentrate for a second on a simulation of “Back in Black” tone, promising as I mentioned above to get back to this in depth to the best of my ability. Guitar straight into Marshall amplifier (to be identified with further precision) passing through a Schaffer-Vega Diversity System (discontinued, it was a wireless unit), then two condenser microphones used to record, then equalization was added (YES, during recording, as to say that what went on tape, even prior to mixing and mastering, was an equalized guitar!). We will be talking about the solo guitar below (with regard to the Eleven Rack). So, according to one interview of Tony Platt’s, it was two condenser Neumann U67 on a single 4×12 Marshall cabinet. According to another interview of his, it was one condenser Neumann U87 and one condenser Neumann U67 on a single 4×12 Marshall Cabinet. Does mentioning the type of microphone used really matter? Heck yes it does. Both the “condenser” aspect and the brand and type of microphone! At the time – 1980 – tapes were still used to record in studios. There was no such thing as hard disk recording yet. Also, the microphones had pre-amplification (tube) and they were plugged into the studio board (mix board) which added itself tone characteristics. The tape – typically 24 inch tape, pretty big – added some compression to the recorded signal, whatever that was. An effect to be taken into consideration as well. As an added surprise, feature, Angus was known to use on the whole album, for all the guitar parts (solo and rhythm) his remote “Schaffer-Vega Diversity” wireless system to plug into the amplifier. This unit had a boost knob on both the transmitter and the receiver end. Angus has been known to use that boost to make the amplifier hotter, thus getting more gain! So as you can see by now, a big number of variables came into play. Unless you have at disposition all of these elements – I don’t! – we have to simulate most of them. 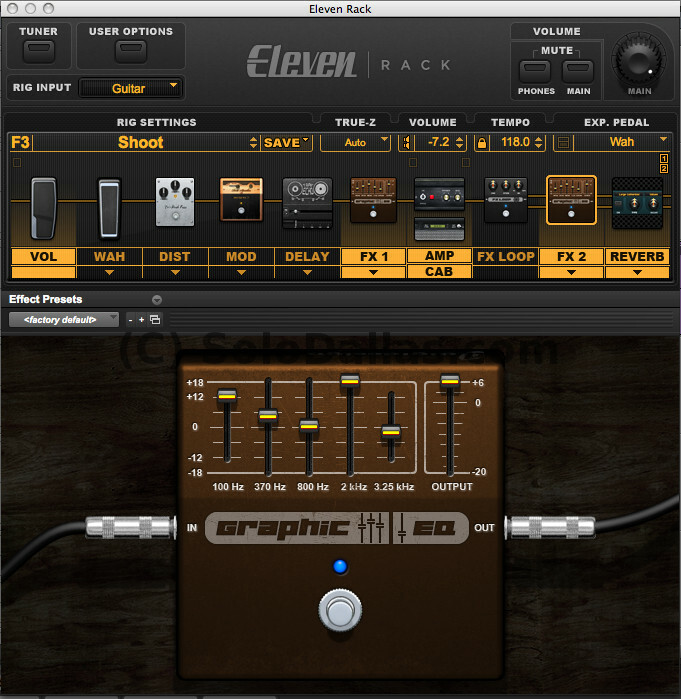 • In order to simulate a signal booster, I chose to not use any modeled stomp boxes in my signal path, but I chose the most transparent booster I could find in the Eleven Rack, this being another graphic equalizer with all the settings to “idle” with the exception of the output of the equalizer itself, resulting in a considerable boost (i.e., added gain). This appears as FX1. In order to being accurate, I placed this additional boost in front on the amplifier in the signal path (see image). The “results” are what you heard on my last videos. For each and every one of them, I always “tweaked” a bit here and there, and so you will have to, too. There are several modeling software and hardware products out there right now. I am still using Guitar Rig 4 at times, but I have been using The Eleven Rack solely for the recording of these last videos. The reason is not the supposed superiority of the Eleven Rack (though some say so), it’s just for this one was new and I wanted to study it in detail. A simulation of the above mentioned signal path will follow on the Guitar Rig 4 as well, soon. I hope you found this interesting, as it does apply to any amplifier and modeler you may have at the moment. The equalization pattern on the graphic equalizer used “in post” (that is, equalization being performed on the signal coming in from the microphones, before going to tape). Post to be continued, edited for improvement. The sound is really excellent … but I am unable to download the 11R patch. I would love getting your eleven rack presets, any chance ? i’d like to use your patch, but it’s didn’t work, because the protools import setting is says: “The selected file is not a valid settings file for the plug-in.”. Please upload your valid file. I love your dedication to the Tone brother! I was looking for a place to start tweaking my 11R to get the best ACDC sound I could and this is a bloody fine place to start. Hey Fil! I was wondering(since you´ve told me that you use the MBox), can you use it with Guitar Rig? And mayby it’s asked too much but would an audio interface as the Edirol FA-66 and Edirol UA-25EX work with Guitar Rig? Thanks in advance! Hi, I’m using the M-Audio FastTrack here (assuming you meant this one). Works fine. Look at their web site, they should have a hardware compatibility list. I don’t know much at all about computer gear for recording videos and audio. I currently use a 2008 imac with imovie for utube videos and garageband. I use a fastrack m-audio audio interface with a SM-57 mike. I want to step up my s\w application because of the limitations with imovie syncing, and single track recording. Any suggestions? Is guitar rig easy to use? Heard Final Cut is upgraded video s\w? Personalmente trovo che Guitar Rig abbia una sgranatura migliore sulle emulazioni Marshall. Have you figured out a good Angus patch for Guitar Rig 4? Keep up the site…awesome!